Blackpool have confirmed Terry McPhillips as permanent manager on a 12-month rolling contract. McPhillips took over the Seasiders on an interim basis after Gary Bowyer left following the opening day draw with Wycombe Wanderers. After losing his first game in charge, the 49-year-old has since led Blackpool on an eight-match unbeaten run. "It's an offer I couldn't turn down, becoming the manager of Blackpool," McPhillips said. The former Blackburn Rovers coach was brought to Bloomfield Road as Bowyer's assistant in October 2017. Among his achievements in caretaker charge are EFL Cup victories against Barnsley and Doncaster, setting up a match with Championship side QPR in the third round. 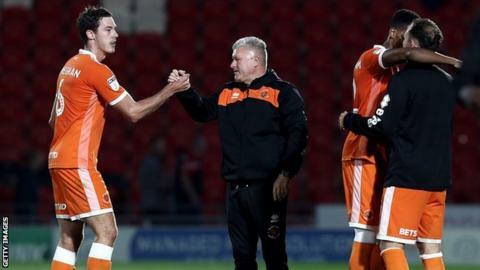 Blackpool are ninth in League One, with two wins and four draws from the opening seven games including Saturday's 3-2 win against Bradford City. "We're eight unbeaten and that run helps," McPhillips added. "Some of the performances in that run have been superb and I'm just pleased this is done now because it takes a bit of a weight off everyone." His first permanent game in charge will be a trip to Plymouth on Saturday.